Keeping your home healthy and safe helps you to be prepared in case of emergencies. You’re also making sure that the spaces in and around your home are a safe environment for family and friends. Your home is where you want to be able to relax, knowing that you and loved ones are healthy and secure. Here are some things to think about when working to increase home health and safety. 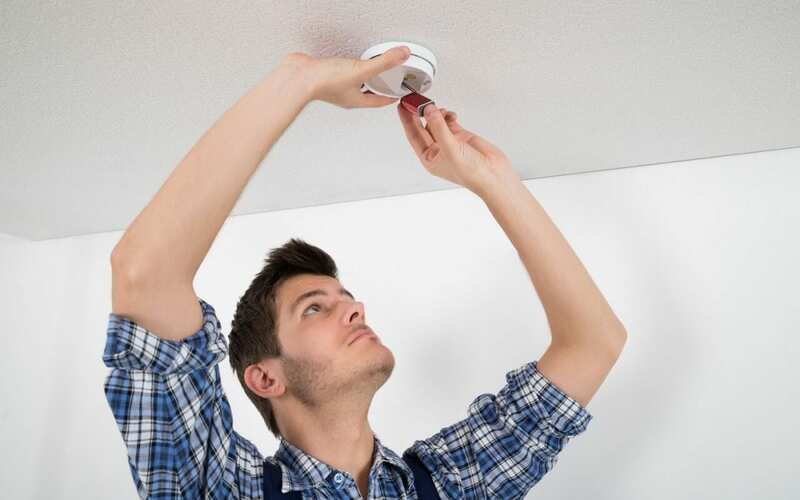 Fire alarms and carbon monoxide detectors should be installed in every home. You should have at least one on every level of your home including inside and outside of each bedroom and in attics and basements. Create a maintenance schedule to make sure these detectors are operating properly and test the batteries each month. You can’t control the air quality outside, but there are some things that you can do to improve the quality of air inside your home. Gaps: Outside air contains pollutants. If you have gaps around your windows or doors, then dust, allergens, and even tiny mites can enter and become trapped in your home’s air. Check for any gaps and seal them to increase home health and safety from outside pollutants. Cleaning: Keeping your home clean is another great way to improve air quality. Dust will settle and be redistributed into the air. Keeping your home dust-free and vacuumed will improve your air quality. Be sure to change your air filters regularly and choose non-toxic cleaning products with no VOCs. Pets: Your pets’ paws and fur can carry pollutants inside that contaminate your air. Clean and brush them often, and outside if possible. Radon is a naturally forming gas that is produced underground and seeps up through the soil. Breathing in high levels of radon gas can cause serious health issues including lung cancer. Have your home tested for radon. If radon is detected, you can schedule professional radon mitigation to increase home health and safety by reducing the amount of radon that is inside your home. Damp conditions inside your home provide ideal conditions for mold to grow. It’s always important to take care of any roofing, plumbing, or other leaks that could lead to water getting inside of your home. Look for signs of mold in your home and take steps to dry the areas and clean the mold thoroughly. Volatile organic compounds (VOCs) like formaldehyde, benzene, methylene chloride, and perchloroethylene can be found in a lot of items in your home. Some materials, like dryer sheets, shower curtains, cigarette smoke, and paint fumes, emit these gaseous compounds at room temperature, getting them into the air supply, and causing potentially serious issues for some people. Research products and building materials to choose healthier options for your home. Regardless of where your water supply comes from, having a water filtration system in place increases home health and safety for you and your family. There are different contaminants in any water supply. Ask your water company for a water quality report and buy a filter to manage the contaminants in your area. Keeping your home healthy and safe is really just a matter of awareness. Educate yourself on potential safety issues and put some systems in place to alleviate them. Aztec Home Services provides home inspections for Harrisonburg, VA and the surrounding areas. Contact us to schedule an appointment.